and one child, Maria, now the wife of Herman Lumke, the latter a well known farmer living near Wisner. Mr. Roepke was for many years a staunch democrat, but at the beginning of the Bryan campaign his sound money principles drove him to the opposing party. He has been active along political lines, as well as in a business way, since taking up his residence in Nebraska. He has been a life long member of the Lutheran church, and contributed liberally to the same, being the donor of two lots on which the church stands, and also donated the bells of the church. William M. Parker, one of the older pioneers of Howard county, Nebraska, whose farm in Cotesfield precinct has long been noted as one of the model establishments of the farming community in that part of the state, is now retired from active work, although he still makes the homestead his permanent residence. Our subject is a native of Mount Ayr, Iowa, born August 4, 1858, and was reared and educated there. he remained on his father's farm until he was twenty years of age, afterwards traveling through the different states for about a year and a half, then came into Howard county where his father had settled about 1872. He at once bought homestead rights and took up a tract of land on section eighteen, township sixteen, range eleven, and began farming. He also dealt in stock quite extensively, and remained on the place up to 1904, at which time he removed with his family to Arkansas, where they spent two years, then returned to the home farm, and have since lived here. Mr. Parker has been very successful in building up his home, having it now in the best possible condition, and there is no more productive or better kept place in the county. The place contains two hundred and sixty-five acres, and is supplied with a complete set of good buildings, well stocked, and is a very valuable property, all of it having been accumulated by the untiring energy and good management of our subject. Lately he has been considerably handicapped front the fact that about three years ago he completely lost the sense of hearing, and has been obliged to use an ear trumpet, although with the aid of this instrument he is able to converse tolerably well with his family and friends. He is recognized as one of Howard county's substantial citizens, and by his earliest efforts and sterling character has gained the highest esteem and respect of his fellowmen. On August 4, 1884, Mr. Parker was united in marriage to Mabel Tucker, a native of New York state, who came to Nebraska several years prior to that time and had been a teacher in the public schools in Howard county. Mr. and Mrs. Parker are the parents of seven children: Ella May, George M., Jesse M., Edna E., Roy L., Olive Belle, and Ruth Pearl. Our subject is the oldest of seven children, one of whom is dead, and the balance, with the exception of a sister, who is in Wyoming, live in Howard county. Mr. Parker has always been prominent in local affairs, and has done much to establish and build up the schools in his locality, serving its moderator of district number fourteen for a number of years. George T. Hather was born in England, December 9, 1828, coming to the United States in 1851, his first location being made at Rush, near Rochester, New York. After residing in the Empire state for about four years, Mr. Rather was united in marriage to Miss Sarah Jane Carter, September 13, 1855. Miss Carter was a native of Rochester, daughter of Joseph and Elizabeth (Court) Carter, who were natives of England, and was born May 12, 1838, sixth in a family of thirteen and the first of American birth. Mr. and Mrs. Hather were blessed with ten children, four of whom are living, namely: Frederick, a blacksmith of Ord, Mary Jane, married George Cooper, now living in Scotia; Matilda, married Fred Divine, and lives in Vancouver, Washington; William has a fine farm a mile and a half north of Ord. A sketch of each of the sons is to be found on other pages of this work. After their marriage Mr. and Mrs. Hather moved to Dubuque county, Iowa, where they remained thirty years, coming from there to Valley county, Nebraska, in 1885, where several of the children had already taken up their residence. At one time Mr. and Mrs. Hather and their ten children all lived in Valley county. Mr. Hather sold his farm in the fall of 1910, and a few months later, December 31, 1910, passed on to his reward in eternity. Mr. and Mrs. Hather have been active along all lines, and assisted greatly in the development of Valley county. Mr. Hather was a member of the Methodist Episcopal church, as is his widow, and she still takes all active interest in church work. Mr. Hather still lives in the memories of all who knew him, and his widow is greatly respected and beloved. rank he held when mustered out. During his service he was under General Sherman three years in the campaigns around Chattanooga and Atlanta, and in his famous march to the sea. Our subject's father died in 1875, but the mother lived in Worland, Wyoming, until at the advanced age of eighty-eight years, she passed away in September, 1910. During his childhood, Mr. Robertson attended the common schools, and at the age of eighteen entered Rock River Seminary, at Mount Morris, Illinois, for two years, studied law, and was admitted to the bar in April, 1874. He then removed to Norfolk, Nebraska, where he engaged in the practice of his profession. He arrived in Nebraska with a small amount of cash and a large determination for success, with gratifying results, as success was his abundantly. After practicing in Norfolk for two years, he removed to Madison, Nebraska, where he practiced for sixteen years, then returned to Norfolk, living there until his death, January 22, 1907. When only sixteen years of age, Mr. Robertson enlisted in Company D, One Hundred and Forty-second Illinois Infantry, after having been rejected three times on account of his small stature and physical conditions. His enlistment was secured May 4, 1864, after successfully eluding the vigilance of the mustering officer. Mr. Robertson was an active republican all his life, and his subsequent history shows how well he has served his state, leaving at his death a record his family may well be proud of. Mr. Robertson was a member of the Nebraska constitutional convention in 1875, which drafted the present state constitution. In 1887 he was appointed by Governor Thayer as commissioner to represent Nebraska at the centennial at the time of the adoption of the constitution of the United States of America, held at Philadelphia. He was delegate to the republican national convention in 1888, and national committeeman from 1888 to 1892. He was appointed registrar of United States land office at Neligh, by President Harrison, and held that office for three years, after which he served as mayor of Norfolk. He was a member of the Grand Army of the Republic, and also affiliated with Norfolk lodge number six hundred and fifty-three, of the Brotherhood Protective Order Elks. On December 29, 1870, Mr. Robertson was wedded to Miss Alma Garver, at Forreston, Illinois, three children being the result of this union, whose names are as follows: Scott G., deceased in 1872; Ruth, married to Professor George C. Williams, who have two children and reside in Ithica, New York; and Sydney, attorney-at-law, who resides at home, and bids fair to follow in his father's footsteps. Among the prominent and successful farmers of central Nebraska should be mentioned William J. Forbes, who in his early years there passed through the usual discouraging experiences of the pioneer in that region a quarter of a century ago. Mr. Forbes is a native of Will county, Illinois, born March, 29, 1862, younger of the two sons (Charlie and William) of James and Mary Forbes, the former of whom died in Will county about 1865. The mother still survives and is living in Arcadia, Nebraska. She married a Mr. Strathdee as her second husband. The son, Charles Forbes, lives in Omaha, Nebraska. Both sons were reared to manhood in their native state and after the father's death the mother and stepfather, George Strathdee, lived for a time in Joliet and later at Willmington, where both boys received their education. William J. Forbes remained in Willmington until his twenty-first year and in the fall of 1882 came to Custer county, Nebraska, his brother having for some time been a resident of that state. The two brothers purchased the south half of section thirty-six, township seventeen, range seventeen, in March, 1883. On April 25, 1886, Mr. Forbes married Miss Nettie Brody, a daughter of Jesse and Annie Brody. The Brody family came to the state in July, 1882, and bought land in Sherman county. Mr. Brody died in 1887 and his widow is now living in Michigan. After marriage Mr. Forbes and wife lived on the farm he and his brother owned until 1894, then sold out to purchase eighty acres of the northwest quarter of section three, township sixteen, range seventeen, and two hundred and forty acres on section thirty-four, township seventeen, range seventeen, in Clear creek valley. Mr. Forbes has developed a fine estate there, which has been the family home since the autumn of 1894. He removed to this place during what was known as the "dry year" and well remembers the trials through which he passed. Four children have blessed the union of Mr. and Mrs. Forbes, namely: George, at home; Florence, Mrs. Sperry; Myrtle and Ralph, at home. The son-in-law, Ray Sperry, was born January 9, 1884, on the homestead farm on the southeast quarter of township sixteen, range seventeen, a son of Amos and Mary Sperry, and was married at Broken Bow, Nebraska, August 20, 1906, to Florence Forbes, and they have one child, Ethel Irene. They live on the Sperry farm, where he was born. Mr. Forbes has always taken an active interest in every public movement for the welfare or progress of the county or state, find is recognized as an upright, public-spirited citizen. He is now a member of the school board of district. number ninety-one. For about a quarter of a century, the above named gentleman has been a resident of Wayne county. He is the proprietor of a fine farm located on section two, and during his long residence here has built up all enviable reputation as a citizen. He is a man of active public spirit, lending his aid and influence for the improvement of conditions in the community. Mr. Spahr is a native of Indiana, and was born in that state June 12, 1869, the son of J. E. and Delia Spahr. Wilbur Spahr is the fifth of seven children. He has two brothers, Frank A. and James H., residing in Wayne county. About 1873, the family moved to Logan county, Illinois, where the father rented land until 1877, when they again moved, this time to Shelby county, Iowa, where the father rented land until coming to Nebraska. In 1884, Wilbur Spahr, with his parents, went to Wayne county, Nebraska, where the father bought the northwest quarter of section two, township twenty-seven, range three. At the time of purchase, this was raw prairie, and J. E. Spahr put all the land under cultivation and built good buildings. He continued to live on the place until his death in 1908. Mrs. J. E. Spahr died in 1903. Wilbur Spahr remained at home until his marriage, although he had previously purchased eighty acres of land. Before marrying, he had built a house on his land, and, following his marriage, moved to the place. In 1899, he sold this land, and purchased another eighty on the northeast half of section two, township twenty-seven, range three, which he made his home until moving to town in March, 1911. In 1909, he added twenty acres to his place, now owning one hundred acres in a body, two and three-fourths miles from Wayne one and three-fourths miles north and one mile west. In 1908, Mr. Spahr purchased about six acres on North Main street, Wayne. In 1910, he built his present home and barn. He now rents his farm. Mr. Spahr is a man of broad mind and keeps thoroughly abreast of the times. He takes all active interest in public affairs, and in political faith is a republican. Mrs. Spahr is a member of the Lutheran church. Jacob W. Abbott, retired, one of the best known and most highly respected citizens of Merrick county, Nebraska, has been a resident of this section over thirty-one years, where he has given the best years of his lifetime to the progression of this state. Mr. Abbott was born in Miami county, Ohio, February 14, 1845, and is the son of Aaron and Elizabeth (Collins) Abbott, being the eldest of seven children. He has one brother residing in Lincoln county, Nebraska, one in Cedar Rapids, Iowa; one sister in Washington county, Iowa, one in Tingley, Iowa, and another in Kansas, the others being deceased. The father died in the army in March, 1863, he having enlisted in Company C, Nineteenth Iowa Volunteer Infantry. The mother died in Merrick county, in 1885. When about two years old, Mr. Abbott went with his parents to Indiana and about 1855 went on into Iowa where our subject received his education and later engaged in farming. On August 18, 1862, he enlisted in Company C, Nineteenth Iowa Volunteer Infantry, serving until close of the war and received his discharge July 10, 1865, in Davenport, Iowa. Decisive battles participated in were Prairie Grove, Arkansas, December 7, 1862; on Van Buren raid, Arkansas, in December, 1862; all through the Siege of Vicksburg; and capture of Yazoo City, July, 1863, and the Siege of Spanish Fort, Alabama, in March and April, 1865. After the war, Mr. Abbott returned to Iowa and engaged in farming, and on January 1, 1873, was married to Miss Elizabeth Taylor of Iowa. In the fall of 1877, Mr. Abbott came with his wife and three children to Chapman, Nebraska, remaining several months when they drove into Kansas where they homesteaded one hundred and sixty acres in Jewell county. In the fall of 1880 they returned to Merrick county and have since resided in Chapman. In 1907 Mr. Abbott purchased a fine farm which he sold recently. For many years Mr. Abbott ran a threshing machine and was indirectly interested in meat market business. Mr. and Mrs. Abbott have had eleven children born to them, ten of whom are living: Ida, who is the wife of Wilson Bishop, has three children and lives in Sutton, Nebraska; Allan, who is married, has two children and lives in Merrick county; Kizzie, wife of Mr. W. Scott, has four children, and lives in Hamilton county, Nebraska; Platte, who resides in Merrick county; David, living in Hamilton county; Blanchard C., married and lives near Chapman; Melbourn, resides in Merrick county; John, in the same county; Iva, who is married to Professor John R. Stevenson, lives in Chapman; Juanita, who resides at home; and an infant deceased. Mrs. Abbott has one brother residing in Arkansas, one in Brighton, Iowa, another in Red Cloud, Nebraska; one sister in Washington county, Iowa, another in Rogers, Arkansas, and one in Iowa. The mother died in 1905 in Chapman, Nebraska, at the mature age of ninety-four years, and the father, James Taylor, died July 13, 1903, in Iowa, also at the age of ninety-four years. Mr. and Mrs. Abbott are among the early settlers of their county, and have passed through all the hardships and discouragements incidental to frontier life. They are widely and favorably known. Andrew Olson, residing on section thirty, township twenty-nine, range two, Knox county, Nebraska is regarded as one of the leading citizen of his locality. Since settling here Mr. Olson has always been an important factor in the upbuilding of his region, aiding materially in its development, and in the growth of its commercial and agricultural resources. Mr. Olson was born in Sweden, January 3, 1854. There he received his education, remaining with his parents up to his twenty-ninth year, at which time he decided to try his fortune in the new world, leaving home and taking passage at Guttenberg in an emigrant ship for America in May, 1883. On landing in New York City he immediately started for the golden west, as he had heard glowing accounts of that country from friends. He first came to Burt county, Nebraska, where he worked on a farm for five years, after which he came to Cuming county, Nebraska, reaching there in 1888, and at once started to look for employment. For a time he rented land and began on his own account, remaining in the locality up to 1894, when the drouth began. He then moved to Cedar county, and farmed for several years, succeeding in building up a comfortable home. He disposed of his interests in Cedar county and came into Knox county, landing here in 1902. Here be purchased a quarter section of good land, which he has improved in splendid shape, and has one of the best equipped stock and grain farms in this section. During the storm of 1888, some cattle belonging to Charles Basom, a neighbor, got into a slough near Mr. Olson's house, and were completely covered with snow. Mr. Olson and Mr. Basom succeeded in getting them out and on higher ground, and all except one of them, which had drifted away, were saved. Mr. Olson was united in marriage to Mrs. Clara Nystrom, in Cuming county, March 12 1889, and to them have been born eight children: who are named as follows: Emil, Nellie, Rudolph, France, deceased; Mabel, Reuben, Frederick and Hazel, all bright and interesting young people, and their home is one of the pleasant and hospitable havens to the traveler in their community. Virgil F. Barnhard, son of John and Nancy (Lambert) Barnhard, was born in Knox county, Ohio, November 20, 1844, and was second in a family of five children; one brother resides in the state of Washington, and the other children are deceased. The father died at Bluffton, Ohio, February 3, 1911, at the advanced age of eighty-nine years, eleven months and thirteen days. The mother died in 1880. After receiving his education, Mr. Barnhard engaged in farming, and on February 9, 1862, was mustered in Company H, Seventy-fourth Ohio Volunteer Infantry, and served until the close of the war, receiving his honorable discharge in July, 1865. During his service he engaged in the following battles: Stone River, Talahoma Campaign, Chickamauga, and was with Sherman from Chattanooga to Kenesaw Mountain, Georgia. He was wounded at Kenesaw Mountain and was disabled for any more active service, being in the hospital at Louisville, Kentucky, for about one year, being mustered out at that place and discharged at Camp Denison, Ohio. After the war, Mr. Barnhard returned to Ohio and again engaged in farming, and later married Miss Minerva Charlton, also a native of Ohio. In 1871 he came to Nebraska, locating for a few months in Colfax county, and in the spring of 1872 came to Boone county, homesteading one hundred and sixty acres in section twenty-two, township eighteen, range seven, west, which remained the home place a good many years. Mrs. Barnhard died June 22, 1884, on the home farm, survived by her husband and eight children: John, who is married and lives in Cedar Rapids, Nebraska; Mary, married to Frederick Wright, has three children, and lives in Boone county; Bessie, who was the wife of Frank Bealer, died in 1907, leaving six children; Albert, who is married, has three children, and lives on the original homestead; Newton, married and lives in Boone county; Nannie, married to George Schoolcraft, has four children, and lives in Nance county, Nebraska; Herman, resides in Boone county; and Adolph, who is married, has two children, and lives in Cedar Rapids. On New Year's day, 1891, Mr. Barnhard was joined in wedlock to Mrs. Hattie Mentz, of a Platte county pioneer family. Her parents came to Nebraska in 1871; the stepfather, H. A. Saunders, is deceased, and the mother died at Iola, Kansas, in March, 1910, at the advanced age of nearly seventy-nine years. Mrs. Barnhard has a sister residing in Missouri; two brothers in Kansas; and one sister in St. Edwards, Nebraska. In 1901, Mr. Barnhard retired from the farm and moved to Cedar Rapids, where he has built a good home, which is his present residence. He enjoys the esteem and confidence of the people, and served on the school board for fourteen years, which length of service proves how creditably and faithfully he performed his work. Mr. Barnhard has been prosperous and successful and enjoys a wide acquaintance, and is a member of Caddall Post, number seventy-four, of the Grand Army of the Republic. of Nebraska. Mrs. Griffin's maiden name was Lucinda Sterling, her birthplace being in Crawford county, Pennsylvania. She married Pat Griffin in Crawford county, November 12, 1876, he being a native of Canada, of Irish descent, born in 1858. Five children were born to them, one of whom, Rosa, died when an infant, and the others are: John, Thomas, Charles and William Patrick. The first and the last are married, and all live in Knox county. Mr. Griffin and his family left Pennsylvania in 1880, headed for the west, their first location being in Saunders county, where they remained for six months. From there they drove through the country to Knox county with a team and covered wagon, and on the day of their arrival in the locality their little daughter, Rosa, was injured by an accident and died the following day. During this trouble they were indeed "strangers in a strange land," and of all their after experiences, none seemed so hard as this. Mr. Griffin settled on a homestead which has remained their home up to this time, and they are now the owners of a fine tract of land consisting of one hundred and sixty acres, all in a high state of cultivation. the entire place is equipped with good buildings and fences, and shaded by many fine trees, which were all planted by Mr. Griffin and his family. The farm is located on section four township twenty-nine, range seven. J. A. Gustus has spent many years in Nebraska and has passed through much of the early history of the state, having met all the discouragements and trials incident to pioneer life. He has become well known in Custer county, where he has a large number of friends. He was born in Sweden, December 21, 1855. When he was seventeen years of age, having received a common school education, he left his native land and came to America, spending some time in Michigan. Later he joined an uncle, John Gustus, in Geneseo, Illinois, and there worked evenings as clerk and attended a private school. On August 24, 1879, in Moline, Illinois, Mr. Gustus was united in marriage with Tilly Louisa Vangreen, also a native of Sweden, who came with her parents to America in early childhood. He was employed in the works of the Moline plow factory and they made their first home in that city. In 1881 they came with their two children to Omaha, Nebraska, and in the fail of 1884 they came on to Custer county. Mr. Gustus secured a homestead twelve miles west of Callaway in Elim Valley, and made his home there until 1890, bringing the land into shape for successful farming. Since 1890 the family have lived in Callaway and he is associated with the farmer's Co-operative Creamery Company at that place. He served several years on the school board and has at all times taken in active interest in the affairs of the community. Seven children were born to Mr. and Mrs. Gustus: Arthur C., of Omaha; Sophia, wife of S. C. Waldron, of Custer county, has four children; Mabel, wife of Dan Pearson, lives in Callaway; Esther, Josie, John, and Varner, at home. The family are well known in Callaway and Mr. Gustus is recognized as a progressive, public-spirited citizen and honest and upright in his dealings. Warren G. Collins, son of John C. and Fanny (Godfrey) Collins, was born in Allegheny county, New York, December 2, 1845; he was the youngest in a family of six children, and now has one brother, Nelson Wilder, residing in New York state, one brother, Rufus J., in Ord. Nebraska, and a sister, Mrs. Olive A. Clark, living in Brown county, Nebraska; two brothers are dead. The parents both passed away in Valley county, Nebraska, the mother November 8, 1874, and the father September 2, 1886. In 1863, Mr. Collins went with his parents to the state of Wisconsin, where the family lived for nine years, engaging in farming. On January 30, 1869, he was married to Miss Amanda M. Thurston, of Maine, and later of Wisconsin. In the spring of 1872, Mr. Collins came with his wife and one son to Valley county, Nebraska, driving through from Wisconsin, the journey occupying some fifty-three days. For a few weeks they camped under their wagon cover, then built a dugout on Mr. Collins' sister's land, in which they all lived for a month or two, during which Mr. Collins suffered an attack of typhoid fever. with no physician to attend him. He homesteaded one hundred and sixty acres of land in section thirty-two, township nineteen, range thirteen. Here he erected a dugout with a log front, and in this they lived ten years before erecting a comfortable dwelling. During these days Grand Island was their nearest market. It required ten weeks to haul ten loads of wheat to Grand Island. Grasshoppers consumed their crops for three years, making mere existence a hard problem. During the early days, hospitality was universal. Every one would find a place for the wayfaring, no matter how many there might be nor how small. the house. Frequently Mr. Collins' floor would be so full of sleepers - men freighting cedar posts of poles to Grand Island or supplies to the sand hills - that it would be difficult to pass through without treading on them. Every one carried his own "grub box" and blankets, otherwise he might go hungry and be exposed to cold and storms as he slept. A view of Mr. Collins' primitive dugout, together with the modern dwelling on the farm, are shown in contrast on another page. moved to Ord, where he purchased a good home where they now live. He has been prosperous and successful, owns six hundred acres of good land, which is utilized for grain and stock. raising, and is widely and favorably known. Mr. and Mrs. Collins have had eight children: Oscar E., who is married, has six children, and lives on the old homestead; Carrie M., wife of W. H. Seeley, lives in Milford, Nebraska, and has three children, (Mrs. Seeley was the first white child born in Valley county); Helen E., a nurse, who resides in Mitchell, Nebraska; Earl W., who is married and also lives in Mitchell, Nebraska; Ralph H., who is married and lives in Valley Count. ; Lynn V., resides in Valley county, Nebraska; Rex E., also a resident of Valley county, and Floyd M. R., who resides under the parental roof. 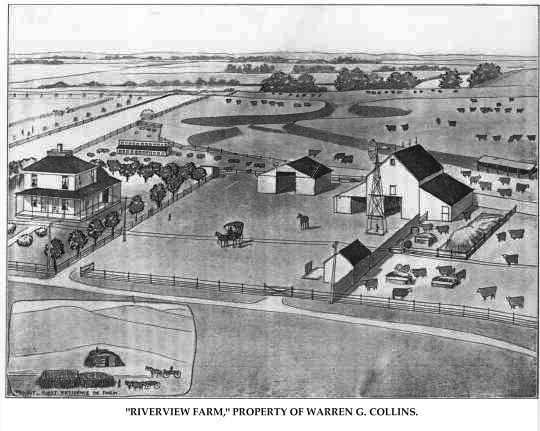 "Riverview Farm," Property of Warren G. Collins. To the men of perseverance and stalwart determination who went to Nebraska when it was yet undeveloped as in agricultural and commercial region, the present prosperity enjoyed there is due. Among the early settlers of Pierce county who have been intimately identified with its development and who have gained enviable reputations as citizens, may be mentioned John B. Roberts, a prosperous and successful farmer of Clover Valley precinct. Mr. Roberts is a native of Illinois, born August 5, 1855, and lived in Logan county, Ohio, until 1865, when the family removed to Fremont county, Iowa, crossing the Mississippi river the day of Lincoln's assassination. Here they lived sixteen years, and three years in Monona county. The father was a native of Ohio, and the grandfather came from Wales, and settled in New York state in the early years of the Republic. In 1885, Mr. Roberts, our subject, moved by team to Nebraska, where he took up a claim in Pierce county, on section twelve, township twenty-five range four, and built a good frame house, and planted fifteen acres of trees. After seven years' starvation on the land, he traded it for a team of horses and for eleven years rented from George Littell and John or Henry Spink. In 1900 he bought his present place of three hundred and twenty acres in section twenty-four, township twenty-six, range three, owning besides a quarter section within sight of the home farm. Around the home he has a grove of some twelve acres in extent, and two acres of fine orchard. Mr. Roberts has been very successful in every venture He has undertaken of late years, but, like others who lived on the frontier of Nebraska in earlier days, he has seen hard times. During the blizzard of January 12, 1888, Mr. Roberts was too ill to leave the house, and to keep them from freezing, Mrs. Roberts and a small son carried corn from the barn some distance from the house; this was their only fuel at that time. For two winters they burned twisted hay. Mr. Roberts was united in marriage to Miss Rebecca Hawhee, a native of St. Louis, and daughter of William and Nancy A. (Morgan) Hawhee, who moved to Page county, Iowa, when Mrs. Roberts was a child. Mr. and Mrs. Roberts have had eleven children, named as follows: Alphareta, married Charles Staley, of Tecumseh; William Frederick, married Nancy Murphy, and lives near Blake, in Holt county; Blanche, married Raymond Huckens; Cecil, married Herbert Smith, of Oshkosh, Nebraska; Claude, married Lona Garvey and lives near Pierce, and Thomas W., married Bertha Kloke. Mr. and Mrs. Roberts are proud of the fact that they are the progenitors of seven sturdy grandchildren. Mr. Roberts is affiliated with the Masonic and Woodmen lodges. He has the greatest faith in the possibilities of this country, and with good management and industry, he has acquired a position of ease and prosperity, to which his beautiful home from its high point of view stands testimony. Sophus A. Sorensen, a successful and energetic young farmer of Howard county, Nebraska, is owner of a fine home near Nysted and accounted one of the prominent citizens of his locality. Mr. Sorensen is a son of Larke and Johanna Sorensen, and was born on January 12, 1880, in Howard county. He lived at home until about twenty years of age, then started for himself. His education was obtained in the local schools, and he also attended the Danish academy at Nysted for one year. He purchased a farm and began in the stock raising business in which he has been very successful, carrying on also with success diversified farming. He now owns and lives on his father's original homestead situated on section thirty-two, township fourteen, range eleven. All of this land is highly improved and well equipped with fine buildings, and he is recognized as one of the progressive and thrifty young men of his vicinity. Mr. Sorensen was united in marriage on June 1, 1904, to Dorothy K. Faaborg, of Audubon, Iowa. Mrs. Sorensen is also of Danish parents, born and raised in Iowa where her parents still occupy the homestead which they settled on many years ago. Mr. and Mrs. Sorensen have one son, Larke F., a bright boy and of whom the father and mother are justly proud. The family have a pleasant and comfortable home and enjoy the society of at large circle of friends and acquaintances in their community. Farm, is known as one of the earliest pioneers of Nebraska. Mr. Pocock was born in Tuscarawas county, Ohio, on the thirtieth day of March, 1838, in a two-story hewn log house - a very pretentious dwelling for those days. He was the ninth child in a family of six sons and four daughters born to Eli and Catherine (Knestrick) Pocock. When he was only four years old, the family moved to Fulton county, Ohio, where Mr. Pocock grew up on a farm. In the spring of 1858, he left Ohio, and came to Cass county, Nebraska. He came by rail to St. Louis, then by steamer to Weston, Missouri, by stage to St. Joseph, thence to Glenwood, Iowa, and from there on foot to Plattsmouth, Cass county. On August 16, 1860, Mr. Pocock was married to Miss Lucinda Patterson, in the Platte Valley House in Plattsmouth. Mrs. Pocock is an older pioneer than Mr. Pocock, as her family came to Cass county in 1855, three years before he put in an appearance. Mr. Pocock engaged in farming until October, 1862, when like thousands of others, he decided that the country was in need of his services, and he accordingly enlisted in Company H, Second Nebraska Cavalry. He was in frontier service in the west during almost the entire time of his enlistment, and was discharged at Plattsmouth in December, 1863. His services extended as far west as Fort Pierre, and he participated in the battle of Whitestone Hill where the cavalry captured five hundred hostile Yankton Sioux, who had been guilty of the New Ulm massacre in Minnesota in 1862. After leaving the army, Mr. Pocock returned to Cass county, where he remained on his farm until January, 1881. At that time he and his family removed to Nemaha county, but they remained here only about four years, when they decided to move again, going this time to Nance county. In 1901, having at last secured a place which suited him, Mr. Pocock moved to Valley county, and he and his wife now reside there in their comfortable and cozy home. Since buying the Valley county farm, Mr. Pocock has made many improvements on it, and the Maiden Valley Stock Farm, as it is now called, is considered one of the finest in the county. Mr. Pocock has had the varied experiences through which all Nebraska pioneers were forced to struggle and now he and his wife are enjoying the fruits of their toil. Of the eight children born to them, six are living: Laura Ida, now Mrs. J. Q. Churchill; Glenn E., Edward, who is the active manager of the farm; Jessie, now Mrs. Charles Russel, of Genoa, Nance county, Clara Lela, (Mrs. Roscoe Williard), and Stella. All of the children, with the exception of Stella, were born in Cass county. The family is well and widely known in the several counties named before, and have the respect and esteem of a large circle of friends. Mr. and Mrs. Pocock celebrated their golden wedding anniversary in August, 1910, many of their family and friends being present. Mr. Pocock is independent in politics, is a member of the Independent Order of Odd Fellows and of the Grand Army of the Republic. Mr. Pocock endured the many privations of pioneer life in the west. While in Nance county he lost forty acres of corn by a hail storm June 27, 1894, when hailstones fell the size and shape of door knobs. While in the cavalry in 1863, he was out in a hailstorm which covered the ground to the depth of four inches. Grasshoppers devastated his crops two seasons, the summers of 1874 and 1875. Philip Miller, the. subject of this review, is one of the representative farmers of Madison county, Nebraska, and a man who has done his full part in promoting the development of the agricultural interests of the community in which he lives. Mr. Miller owns a valuable estate in section thirty-one, township twenty-four, range four, and is one of the prosperous and highly esteemed citizens of this region. Mr. Miller claims Wisconsin for his native state, his birth occurring there April 29, 1854; he is a son of John and Sabina Miller, both natives of the German Empire. They embarked at Bremen on a sailboat and were sixty days on the sea, and upon arriving near American shores landed in New York City. From here they proceeded to Wisconsin, remaining there the rest of their lives. The father died in 1904 and the mother in 1909. In 1872, Mr. Miller went to Illinois, where he remained until 1884. He then came to Madison county, Nebraska, bringing his family with him, as he had been married in the meantime. Upon reaching Madison county, Mr. Miller bought the Hanson homestead, and on this land built a good frame house, and has steadily improved this place until now he has one of the finest farms in this locality. Mr. Miller now owns three hundred and twenty acres of good land, and has four acres of fine trees on his place. Mr. Miller was united in marriage October 16, 1879, at Champaign, Illinois, to Mrs. Mary McEwen, who is a native of New York state, and a daughter of Edward and Catherine (Lyons) McEwen who claim Ireland as their native land. Five children have been born to Mr. and Mrs. Miller, and are named as follows: Arthur, Ivy, Irwin, Mayme, and Grace. Mr. Miller is a prosperous man of affairs, well known and highly esteemed and respected in his community, and he and his family are surrounds in their pleasant home by a large circle of friend and acquaintances.